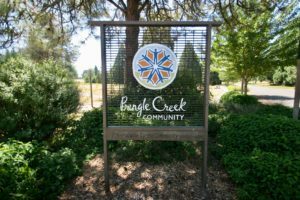 Pringle Creek Community is one of a kind. We are buzzing with building and welcoming new families into our community. Choice lots are available next to green open space, the orchards, as well as lovely neighbors who believe in sustainability and live it! What’s interesting is that we’re probably one of the best kept secrets in Salem. Yet, we’re situated close to downtown, and very close to places like a microbrewery, a cidery, the climbing gym, and more. So, if you’re interested in doing yoga while you drink a local brew or getting your climb on, it’s just a walk or bike ride away. Our little urban oasis is tucked away in the midst of so many fun things to do. If you’d like to have some quiet time, then you can have a mini-retreat listening to the wind russel the leaves above and the water running over the rocks of Pringle Creek. If you’d like to be social, hop on over to the greenhouses to say, “Hi” to Colleen, our talented Urban Farmer, or saunter down through the orchards to get a pint at Gilgamesh. There’s also yoga, book club, and the chance to start your own club if you feel so inspired at Painters Hall, our community center. Our community is situated in Salem, a beautiful capitol city in the Willamette Valley with so many wonderful activities. If you want to hike waterfalls, hop on over to Shellburg Falls. If biking is more your cup of tea (or energy drink of choice), then ride across the newly completed Minto-Island bridge. If you’d like to cleanse your palette with some of the best tasting wines in the nation (and possibly the world), there are plenty of wineries to choose from. In the downtown, there’s a great variety of restaurants, coffee shops, and boutiques to choose from, too. Start off the morning at the Governor’s Cup for a almond milk latte, then head on over to the Wild Pear to meet up with friends for lunch and enjoy some delicious organic dishes (and cocktails). Later on, taken in a local music show at the Taproot or perhaps a more refined venue at Willamette University to enjoy a musical performance by the Chamber Orchestra. After you’ve had your fun, return back to hang your hat (or bike helmet) at a place where you can pluck a sun ripened apple from a tree, have a play date with the kids (furry ones, too), and remember that you’re living in a community that’s soul mission is to leave a lighter footprint on the earth for generations to come. You can be a part of this. You can be a part of the fun and living healthy and sustainably. We have plans to break ground and build more homes in the future on John Muir Loop. Two of the homes are attached while another home design is the Net Zero. There is a wide variety to choose from, but it doesn’t stop there. If you’re looking for a custom home, we’d be glad to discuss with you how to make it happen. What are you waiting for? We’d be happy to give you a tour of our little urban oasis, so you can see firsthand what living sustainably looks like.